Apartment/ Condo with spectacular views on 39th floor (Apts are larger from this floor and up) at LA PERLA Bldg. on the beach. room. Completely equipped, utilities included (WIFI, local telephone landline, etc.). The building has a gym, pool, Jacuzzi, private access to the beach, valet parking, security, etc. RENT PRICE is NEGOTIABLE depending on season and stay time). Private WIFI inside property Public WIFI at Building common areas including pool and beach areas! Free WIFI service, and landline phone for local calls. In room Jacuzzi,washer & dryer, oceanfront property, heated pool, sauna/spa, gym, security, FREE Valet Parking, FREE Beach Chairs/Umbrella & Towells, etc. This condo was very clean and very inviting! We enjoyed sitting on the deck and taking in the beautiful view! It was within walking distance to many food establishments and grocery stores! Rosa and Jose, the owners are lovely! 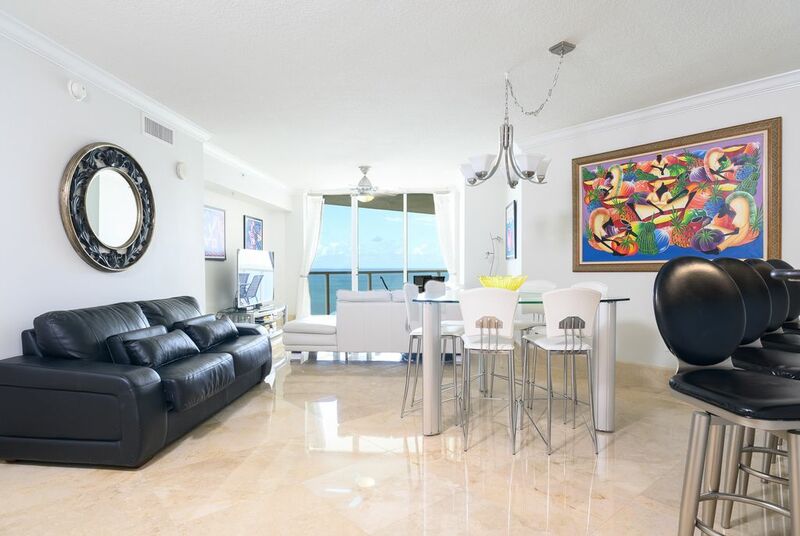 They met us when we arrived and showed us all we needed to know to enjoy our time in Sunny Isles! We will definitely come back here! This was my 2nd stay at this place. Loved it and will do it again. Comfortable, convenient, great owner, and a good deal. Clean, well taken care of unit. The owner is very friendly and responsive. The condo is near a variety of restaurants, cafes, shops, etc. Designated parking in the building. Right on the beach with umbrellas & towel serice. A great place to relax, enjoy the beach and the sea. Rosa (the owner) will be very quick to respond and help in any way she can. Thank you so much for staying in our condo , taking good care of it and for your new request to come back! The apt. Was flawless & stocked w all necessary items , rosa & Jose are the most caring wonderful hosts u can ask for , the only flaw was the management at la Perla steven Walsh & his pet Pablo & Leo make u feel like it's a prison camp & not an exclusive resort , I was actually assaulted by the building manager steven Walsh. Otherwise the apt. & people were beautiful & friends for life. Thank you so much for your positive comments on us the owners, we loved having you as a guest. Also, thanks to your comments on the management since this was used to care of any issues and now everything is fine. This is such a beautiful condo. It has all the comforts of home. The view from the balcony is amazing. The extra large shower is the nicest I have ever used. La Perla's location is hard to beat. This is a must stay for anyone looking to relax and enjoy. El apartamento es excelente y es tal cual la descripción brindada por el website. El mismo se encuentra impecable y sus dueños son encantadores. Ya estamos deseando poder volver el año entrante. Muchas gracias poor su comentario y ojala podamos atenderles nuevamente. Direct beach access, Oleta State Park (kayaking, MT biking, camping, canoieng), fishing. You cannot miss the HARD ROCK CASINO !